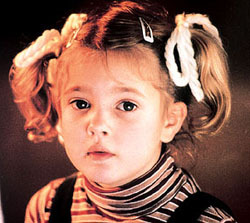 The actress – who shot to worldwide fame after starring in 'E.T. the Extra-Terrestrial' at the age of seven, before entering rehab at 13 –never experienced the normal things children do, such as going to school, and was "moved" when she went on a trip to Kenya because of how passionate the children were about getting an education. Drew says her trip to Kenya made her realise how important it is to donate money to people living in third world countries because it has such a positive impact on their lives. Speaking in the Visionaries issue of Conde Nest Traveller magazine, she said: "It’s amazing to me that the kids mention professions which involve helping others, that they are naturally philanthropic. People can feel unconfident about sending money into the void of a charity. But when you find something like this that speaks to your heart, it gives you the courage to look beyond your own problems and take the first small steps to try as an individual to make an impact. The World Food Programme is a great organisation. There are many celebrities such as Christina Aguilera, Jim Carey who are involved."